Learning music theory online is now easier than ever. There are tonnes of great music theory courses that you can start from the comfort of your home or whilst on the go with your phone. One great place to dip your toe into learning music theory is on YouTube. There are loads of video creators who have whole channels dedicated to helping you to read music and understand what is actually going on. But a quick youtube search on music theory returns an absolutely huge number of results. Over 17 million. A bit daunting if you’re not sure where to start. You can see how it would be very easy to get lost in the sheer magnitude of videos to choose from. 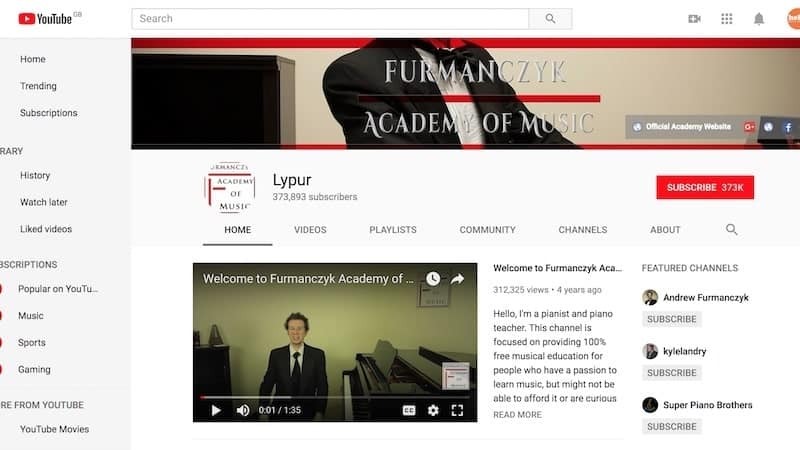 I’ve been watching a lot of them over the last couple of weeks, and I’ve narrowed down a nice list of music theory youtube channels that are worth checking out or at least might be a good starting point. As with find a music teacher in real life, you need to find someone who is a good fit for you. Every music teacher is different and will explain things in their own way. Some might go to slow for you or others might race through certain subjects. For that reason, it’s probably worth trying out a few of the different channels to see which one suits you best. One thing to mention though about learning music theory on youtube. It’s really good to get to grips with the fundamentals of music theory. Or it’s an awesome resource to jump in and out of certain topics that you need to top up your knowledge on. But if you’re looking to find someone that takes you through step by step everything you need to know for an ABRSM exam you might struggle to find someone. Most of the channels will jump around a bit across topics and they may explain some more complex music theory that you probably won’t need to know about for the earlier grades. For something that is more step by step, you’d probably be better off finding an online music theory course. But still, these YouTube channels will get you up to speed on the fundamentals. Enough chit-chat. Let’s take a look at some of the options. A good place to start is over at Dave Conservatoire. 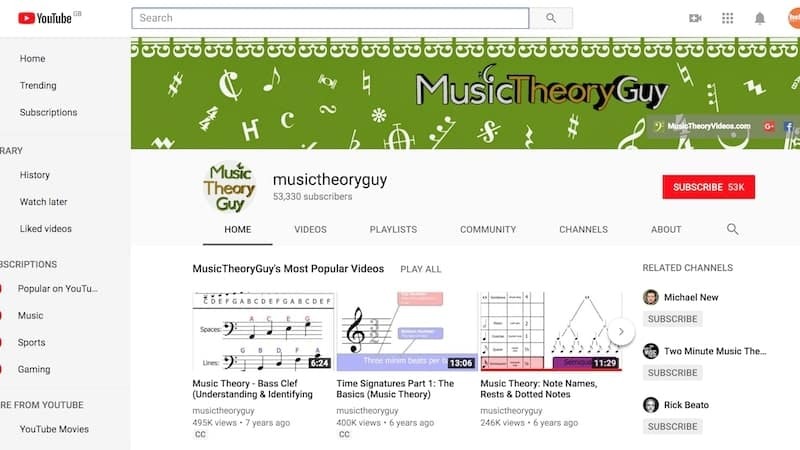 With over 250 videos covering all the music theory topics you could think of, I’m almost certain there will be a video for you. As well as all the basic music theory videos it also covers some more advanced music theory and other topics like using Muse Score which is a free music notating software and improvisation. 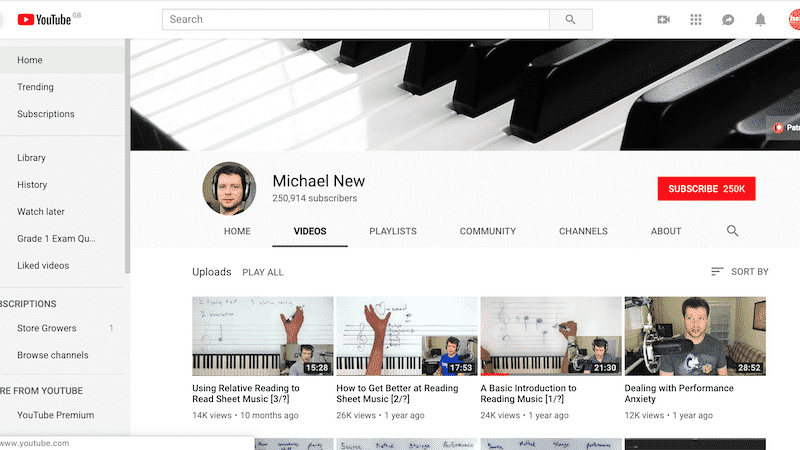 Now we have one of my favourite channels on learning music theory from music teacher Stephen Wiles. He explains things very simply and you can tell he’s been a music tutor for a long time. A big range of videos across all the fundamental topics. Also the sound and video quality are good plus the animations and illustrations work well too. I really enjoyed watching this chap’s music lessons. He’s slightly eccentric but knows what he’s talking about and with over 50 videos on music theory he’s really put some work into these videos. The downside is the quality of the videos is quite bad and they don’t have great lighting. They’re also are not labelled very well so you can’t see what the video is about by the title which is quite annoying. Still, definitely worth a watch as he’s a good teacher. 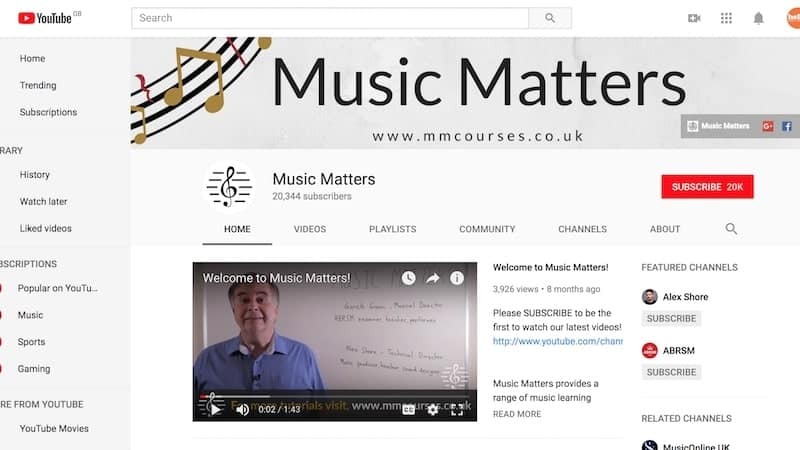 Music Matters is a website and youtube channel put together by Gareth Green and Alex Shore. They have a series of premium music theory courses taking you step by step through each grade. Their YouTube channel though is full of loads of free videos and snippets from his courses that he presents as tips. 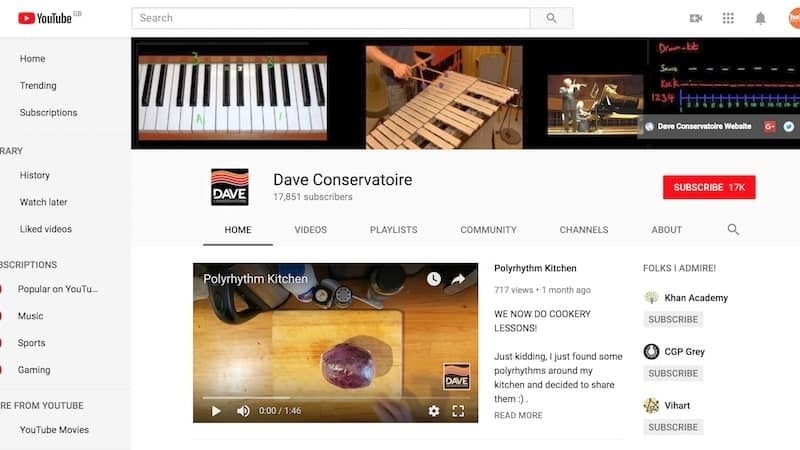 They also have videos on scales and arpeggios as well as composition, aurals and lots of other useful topics for anyone learning an instrument. 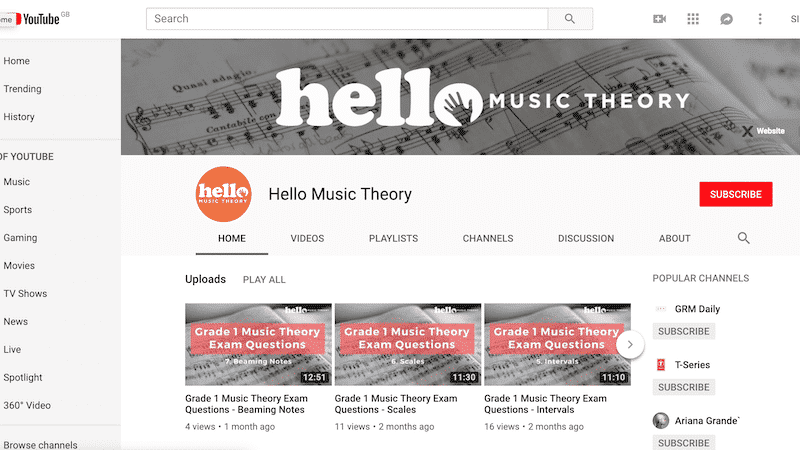 I’ve always wanted to have my own YouTube channel and last year I started posting a few videos going over some of the types of exam questions that could come up in ABRSM exams. In each video I go over how I would approach answering a music theory question and some of the things to look out for. I’ll be adding some more in 2019 too so if you have any requests of topics to cover just let me know. Michael New’s YouTube channel is fantastic and varied in the topics it covers. He answers loads of specific questions that you might have as well as teaching how rhythm works, reading music and harmony. Definitely worth checking out if you’re a student. Well explained, concise and some good ideas about practising and dealing with nerves too.